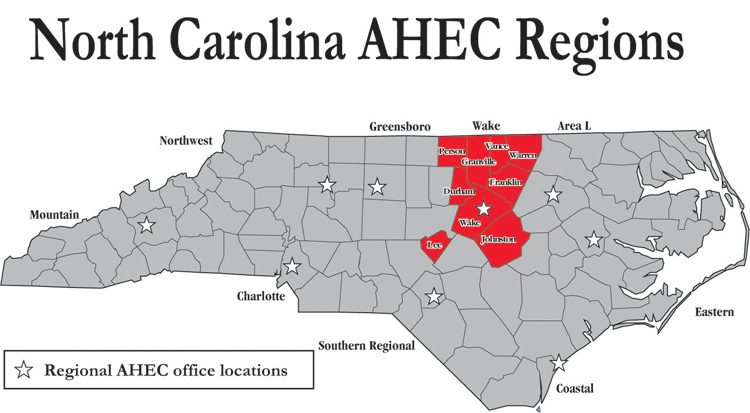 Wake AHEC serves nine counties in central North Carolina from its office in Raleigh. AHECs in North Carolina share a common goal to improve access to healthcare for the underserved and to provide continuing education opportunities and services to healthcare professionals. Wake AHEC serves the Durham, Franklin, Granville, Johnston, Lee, Person, Vance, Wake, and Warren Counties. Copyright 2000-2019 Wake Area Health Education Center. All rights reserved.